2018 Ortner Preservation Awards – Application deadline January 15th! Have you recently restored your historic building? Helped organize a committee to save a piece of Park Slope history? If so, applications and nominations are being accepted for the Park Slope Civic Council’s 2018 Ortner Park Slope Preservation Awards. Maintaining the past for future generations. The Awards were inaugurated in 2014 to recognize construction projects and interventions that honor the original architecture and maintain the unique identity of Park Slope. EXTERIOR RESTORATION: the repair of and/or duplication of significant architectural details to preserve the integrity of a structure’s decorative and functional elements. REHABILITATION OF A HISTORIC STRUCTURE: significant exterior modifications, alterations and/or additions to a building to make it habitable and compatible with its original architectural character. ADAPTIVE REUSE: transformation of a building to serve a new purpose while maintaining its architectural integrity, thereby sustaining the unique identity of the neighborhood. NEW CONSTRUCTION: design and construction of a new building that, while contemporary, complements the historic character of neighboring structures. NEIGHBORHOOD INTERVENTION: action by an individual or group to prevent the demolition or disfigurement of a historic structure or the erection or modification of a building that will have a detrimental effect on the appearance and historic character of Park Slope. The Awards honor Evelyn Ortner (1924-2006) and Everett Ortner (1919-2012), long-time residents of and advocates for the community who, beginning in the 1960s, played a pivotal role in transforming Park Slope – then a neighborhood in decline – into the vibrant community that it is today. The couple also was at the forefront of efforts to prevent the demolition of historic urban neighborhoods, often undertaken by urban renewal programs. By encouraging people to purchase houses in Park Slope and other historic neighborhoods, the Ortners helped these communities regain their social, physical and economic vitality. 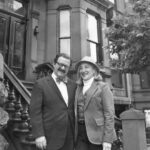 The couple also played key roles in the creation of the Park Slope Historic District, the largest landmarked district in New York City. The building or intervention must be within the area bounded by Flatbush Avenue, Plaza Street West, Prospect Park West, the Prospect Expressway and the west side of Fourth Avenue. Projects must have been completed between January 1, 2013 and December 1, 2018. The project must comply with applicable New York City codes. Current Trustees of the Park Slope Civic Council and Ortner Award Jurors are prohibited from having any involvement with any project or intervention that is a candidate for an award. Applications for the Ortner Preservation Awards must utilize the application form template that can be downloaded at the bottom of this page. Recipients of the awards will be selected by an independent jury of experts in architecture, historic preservation and community engagement. Tentative Jurors for the 2018 Ortner Awards are: Ingrid Abramovitch, architectural writer; Simeon Bankoff, Executive Director, Historic Districts Council; Bob Braun, architect & member, PSCC Historic District Committee; Kyle Johnson, architect, Advisor, Historic Districts Council & member, PSCC Historic District Committee; Clem Labine, founder: Old House Journal, Traditional Building & Period Homes; Laurie Lieberman, architect; Andy Taylor, architect/Instructor, Institute for Classical Architecture. The awards, which are sponsored by Tarzian Hardware, will be presented at the March 7, 2019 meeting of the Park Slope Civic Council. Questions about and Nominations of candidates for and questions about the 2018 Awards can be e-mailed to John Mazurek, the awards administrator, at jmazurek15@gmail.com. To download the application form, please click here.